Jama’at means congregation. 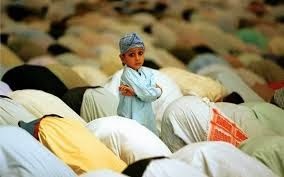 When Muslims gather to offer prayers (Arabic - Salah) in congregation, it is called Jama’at. It is led by the Imam and the rest follow him (called muqtadees); there is a great reward for offering prayer with the congregation. 6) Jama’at is compulsory for every sane and mature man who has the ability to offer Salah. It is very important for the people living in the vicinity of the mosque to attend the Jama’at. 7) To move closer to a mosque or madrasah (religious school) with the intention of attaining Jama’at is a very commendable action. May Allah give us the guidance to keep our mosques and Madrasahs alive. In fact, keep this in mind when moving or buying a house. 8) If you live so far that you cannot drive or walk to the mosque or madrasah comfortably then make sure to come for Jama’at at least once or twice a day or week or more [based on distance and means of travel] to at least earn the reward of coming for and praying with Jama’at. 10) One should not think ‘I can’t join the Jama’at, I am too busy with school or work and family’. Such thoughts are from the devil or our own ill- self. If you make the intention and effort, Allah-willing, the hardships will go away. 11) Stand in the saf (rows) shoulder to shoulder so that there is no space left in between.